50+ Lessons from this Favorite Jewelry How-to TV Show! Enhance your designs and boost your skills with projects and technique tips from the jewelry-making TV series trusted nationwide by artists like you. 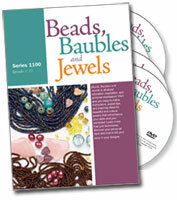 Packed with over 50 how-to lessons, the 11th season of Beads, Baubles, and Jewels gives you all the tips and how-tos you need to take the next step in your journey as an artist. Learn the design secrets of favorite artists: Leslie Rogalski, Marlene Blessing, Jean Campbell, and many others. Skip the guesswork with up-close shots and step-by-step guidance. Create on your own schedule: start and stop each lesson when it's convenient for you. Dive into new techniques, improve your skills, and enhance your designs. Advance your skills with this must-have, easy-to-follow designer resource. Order your copy of Beads, Baubles, and Jewels today! Discover secret tricks to improve your designs. Don't miss a step! Up-close shots make it easy to see what to do next. Make professional-looking pieces with expert techniques made easy. Add style to your designs with step-by-step projects and tips. Order your copy of this watch-and-learn designer resource today!